1. Tear king mushrooms vertically into quarters (use your hand) and then cut them into bite size. 2. Cut baby pok choy vertically into quarters. 3. Boil water in a medium sauce pan and add 1tbsp canola oil and 1/4 tsp salt. Blanch pok choy for 20 seconds and put them into ice water. When they are cool, take them out from the cold water and dry with a kitchen towel. Set aside. 4. Heat a fry pan with high heat. 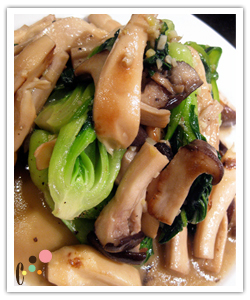 Add remaining 1tbsp oil then king mushrooms and cook for 2 minutes. Add pok choy and garlic and stir fry for 1 minute. Add stock and cook another 1 minute. Season with 1/4 tsp or more salt (depends on the stock you use) and paper.